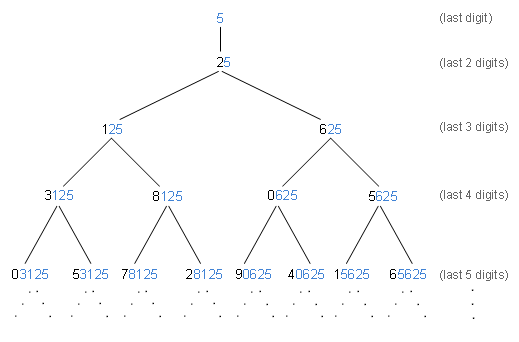 The tree layout shows that certain pairs of ending digits are related, and that these pairs differ by five in their starting digits. I will show why this is true. Pradeep Mutalik of The New York Times recently blogged about a puzzle that is an instance of the Josephus Problem. The problem, restated simply, is this: there are n people standing in a circle, of which you are one. 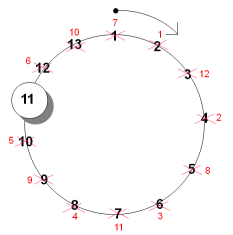 Someone outside the circle goes around clockwise and repeatedly eliminates every other person in the circle, until one person — the winner — remains. Where should you stand so you become the winner? As Pradeep and his readers point out, there’s no need to work through the elimination process — a simple formula will give the answer. This formula, you won’t be surprised to hear, has connections to the powers of two and binary numbers. I will discuss my favorite solution, one based on the powers of two. The laws of exponents apply generally to any base; two is no different. But since we’re interested in powers of two, we’ll couch them in terms of powers of two. Once we explain the laws in this way, you’ll understand the math behind the example above.